Plain Wrong. 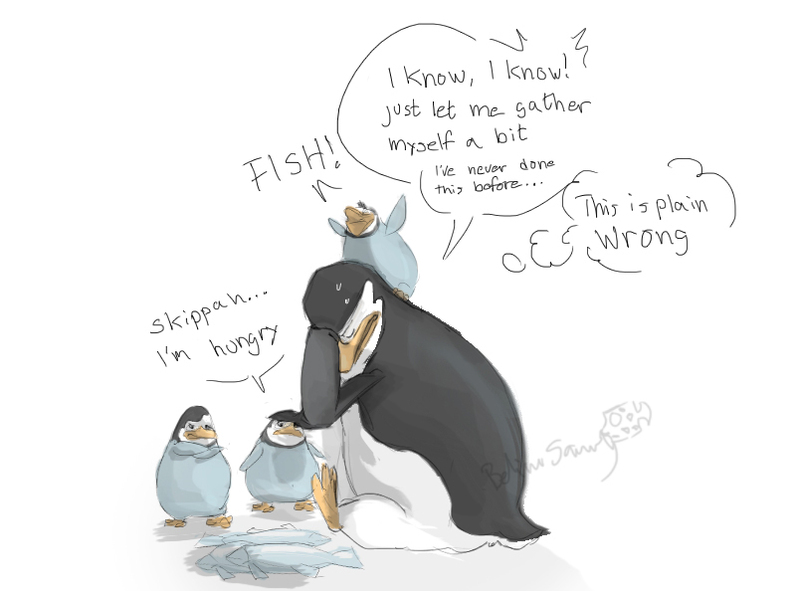 Skipper doesn't seem to be comfortable with the idea of ​​feeding his men. HD Wallpaper and background images in the पेंग्विन्स ऑफ मॅडगास्कर club tagged: penguins of madagascar skipper kowalski rico private. Yes Skipper, just man up and ask the lemurs for their blender! Skipper doesn't have to regurgitate food into his teammates' beaks, however. He could just regurgitate into a container of some sort. Or use a blender. I would vote for the blender; it's such a wonderful appliance. Dude you are a penguin! IF you can't regurgitate like a normal penguin then man up and ask Julian for his blender. But he did regurgitate the Hoboken Hollow Tooth... But when the hell did he swallow it? & HOW! That thing was almost as big as he was!! !